The Association for the Promotion of Social Products held its first Social Products Awards ceremony on May 16, 2013. Odecafe, a company run by Maruc Co. in Ehime, southern Japan, received the jury award. Odecafe (a play on words between "odekake," which means "to go out," and café) is a café catering service that opens a café at requested locations for local events organizers and companies, under the concept "bringing a café where there is no café." Odecafe provides not only café catering services but also a community space and support for people with disabilities. Odecafe makes various social efforts: On its menu it offers locally produced vegetables; it donates 10 percent of sales to support the reconstruction of earthquake-stricken Tohoku communities; and serves coffee imported through fair trade. 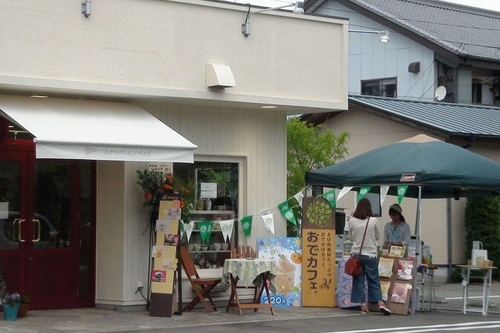 The cafe was rated highly because it was deemed a good business model, has operated in Tohoku providing café services and reconstruction support, and is expected expand further. Moreover, it has a good menu selection and integrates various social efforts into its operation.